Wonder Man — the pacifistic Simon Williams — slides into the narrator’s role in Avengers #686, the twelfth chapter of “No Surrender”, and he does a great job describing the Hulk, his fury, and the effects of both in the twelve pages of smashing and crashing. The Hulk fighting a pacifist goes a bit differently than you might expect, which is a solid testament to the skills of the writing trio of Jim Zub, Mark Waid, and Al Ewing. The writers caption Simon’s assessment of his assailant, but do so through a positive filter, showing how Wonder Man would rather think and talk things through, despite the fact that he is one of the most powerful Avengers and is able to hold his own against the Hulk. The red on not-quite-black captions for Wonder Man are a little rough to read digitally, maybe it’ll be sharper in print, which is really the only complaint I can level against any of the creative crew of Avengers #686. As for the not-quite-black hue itself, letterer Cory Petit and colorist Jesus Aburtov share the tone smoothly from caption background to Simon’s suit. It’s a nice visual link that displays the creative team’s collaboration and is rather uncommon, but very welcome in a story that features so many colors and effects multiplied beyond those colors. Paco Medina brings plenty of detail, as he has done with his chapters of “No Surrender”, and inker Juan Vlasco matches him stroke for stroke, and then some. Vlasco’s lines add a nice variety of shapes and dimension to Medina’s drawings, which alone would be stellar. With gorgeous layouts, brilliant pacing, and smart “camera” work, Avengers #686 is the most visually striking installment of “No Surrender” yet. Medina’s Hulk is absolutely huge, fierce, and powerful. Medina draws Hulk like a monstrous spring poised to erupt. Hulk carries power, even when he’s not striking out, and it is a wonderful visual. Medina crafts a nice variety of figures, and the diverse cast of Avengers #686 presents a nice opportunity for visual diversity. Most notably, since he has the most action-packed panels in the comic (securing the not-so-award) Wonder Man is cut, but not a mini-Hulk. The two tussling titans are not clones of one another, as Medina is able to distinguish the two wonderfully, even before Aburtov adds the radiant eyes. The Challenger shares more physical traits with the Hulk than anyone else in this book, while the not-quite-Goldblum Grandmaster is a strong visual contrast to Challenger’s bulky form. Avengers #686 seems to explode across the page, rather than allow itself to be analytically disassembled. 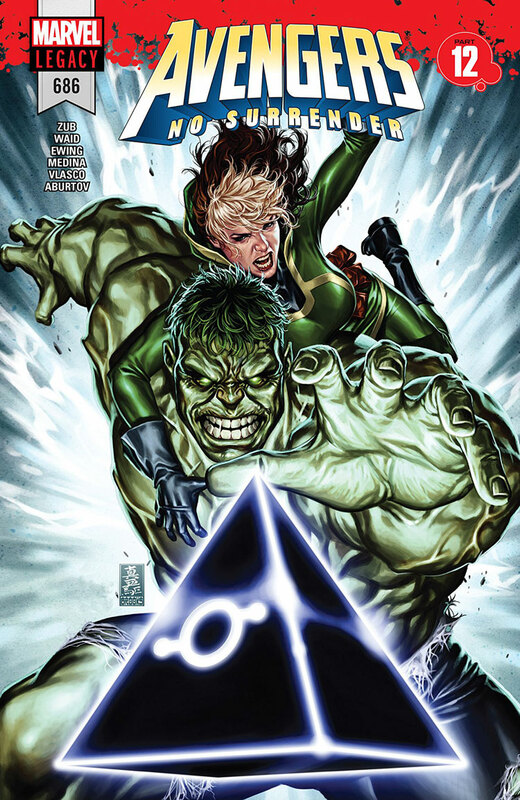 This comic is a visual assault parallel to the Hulk’s attack, but Aburtov magnifies the assault with energy crackles and bolts of blue, green and purple lightning punctuating the pages. Glowing eyes of purple (two different shades actually) and green and even more Kirby Krackle than expected (let’s be honest too much Kirby Krackle is never enough) add even more punch to the pages, as “No Surrender” takes no prisoners among the combatants. This story has run for a year’s worth of comics in the span of three months, and it just seems to be picking up speed. And there’s still more to come.